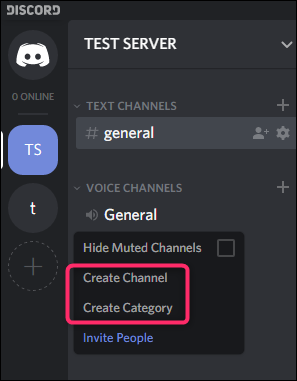 How Do I Create a Discord Server? 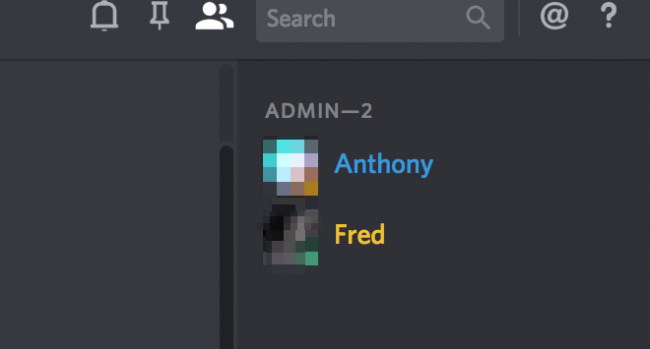 Creating a Discord server is straightforward. 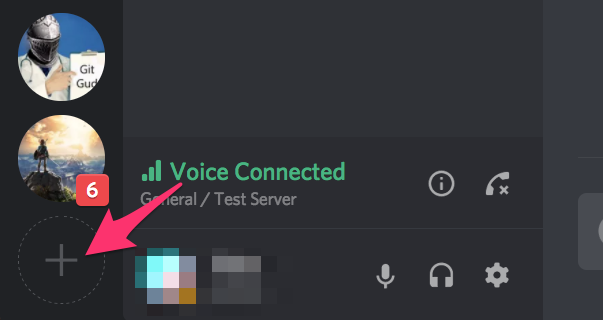 First, you’ll need to either download Discord(Windows, macOS, Linux, iOS, or Android) or open the Discord web interface. Either way, you’ll need to create a free user account to get going. So go ahead and do all that first. 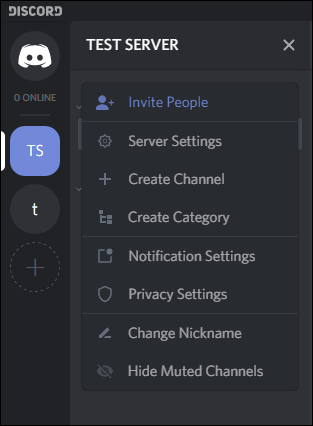 When you first open Discord and sign in, you’ll be asked if you want to create or join a server. 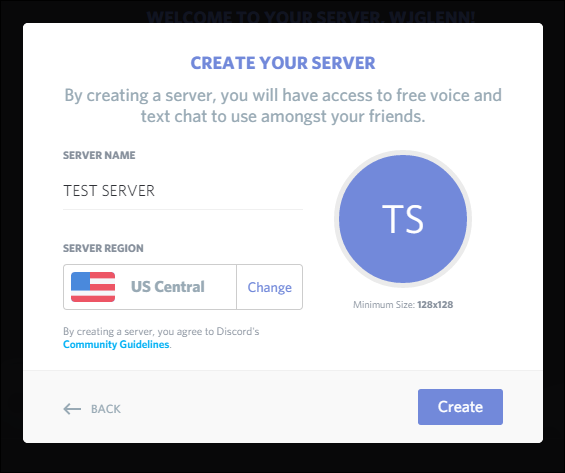 If you already use discord and have skipped this initial screen, you can create a new server by clicking the large plus button in the Discord interface. Either way, you’ll see the same screen. Click the “Create a Server” button to create a new server. 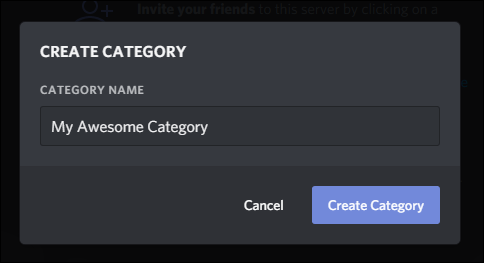 Give your server a name, choose a different region if it didn’t correctly detect yours, and then click the “Create” button. Your new server is created, and you’re automatically connected to it. 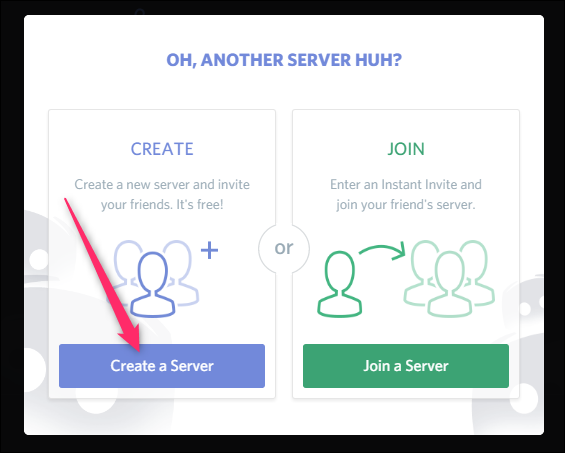 Select your new server on the left and then click the drop-down arrow next to its name to see options for inviting friends, changing server settings, creating channels, and more. 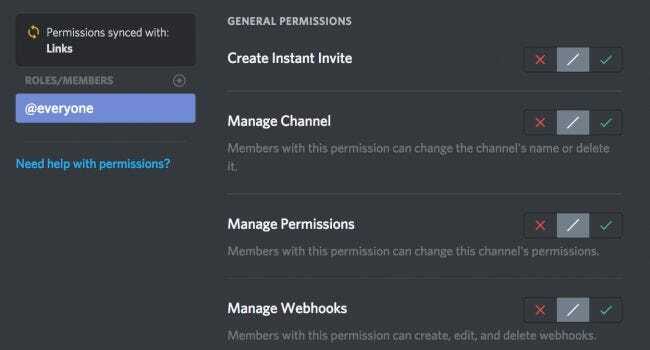 Roles in Discord give users specific permissions. You could, for example, create a role for moderators and give that role the ability to ban users and delete messages. Any users you assign to that role would inherit those permissions. Using roles saves you from having to assign permissions to every user. You could also use roles to do something as simple as giving your friends a cool rank and color. To manage roles, open the server settings and click the “Roles” category on the left. You can add new roles by clicking the little plus button to the side of the “Roles” title on the page. Select a role to manage the permissions. There’s a long list of permissions, but the important ones deal with the abilities to manage the server by creating new channels or roles, manage users by banning or deleting messages, and move users in and out of voice chat. There’s also an Administrator role, which gives every permission except server-owner-specific ones (like deleting the server, for example). The first setting—“Display role members separately”—will make people in that role show up in their own category in the Users panel. You can do some neat tricks by leaving this setting turned off for certain roles. 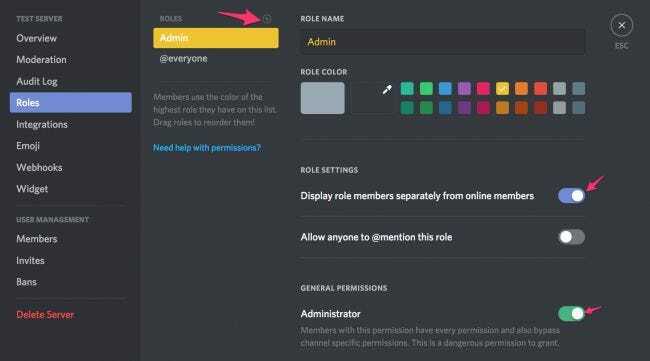 For example, if you have a bunch of admins, but want to make yourself a different color, you can make a new role and put it above admin, but leave that option off so that it won’t create a whole new category. Here, we’ve created a “Cool Color” role and assigned it a color. Now, any user assigned to the “Cool Color” role will be displayed in blue. You can also use this trick with permissions. For example, you could make a “Server Administrator” role with the Administrator permission, and give it out selectively instead of giving it to everyone. 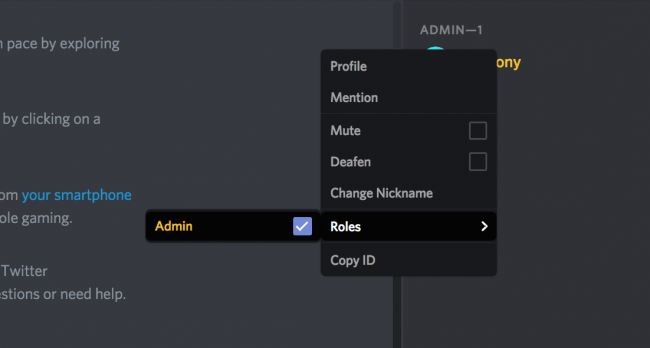 Once you’re done setting up the roles you want to use, you can assign users to those roles by right-clicking their name and enabling the appropriate box on the “Roles” menu. If you have a particularly large server, you can search for people under the “Members” tab in the settings panel, so you don’t have to scroll down the list or @ them. How Do I Organize Channels? Each channel on your server is organized into categories. To create a new channel or category, right-click anywhere in the channel pane and click either the “Create Channel” or “Create Category” command. 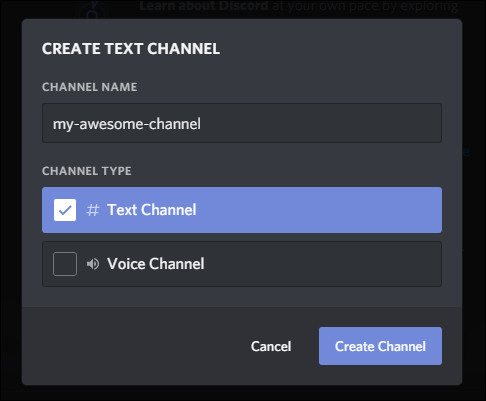 When you create a channel, give it a name and choose whether it should be a text or voice channel. Channel names cannot contain spaces (typing a space just creates a hyphen) or capital letters. When you create a category, all you have to do is give it a name. Category names can contain spaces, and while you can type capital and lowercase letters, they end up displaying in all caps no matter what. Channels also have their own channel-specific permissions, which you can access by clicking the gear next to a channel. These permissions default to sync with the category to which the channel belongs, but if you change them, they’ll stay that way until you sync again. You can also make categories and channels private. When you go to create a channel, just select “Private Channel” and then enables the roles you want to be able to access the channel. If you want only to add a few people to the channel, it’s best to make a new role for that channel, and then add users to that role. All channel specific roles should be above the highest administrative role. Custom color roles placed above admin will give those admins the ability to make new admins, since they’re higher than admin, technically. “Manage Channels” also gives people the ability to delete channels, deleting all the messages in the process. Because of this, you should probably not assign this permission out too much. The same is true for Administrator. In read-only channels, members can still add reactions with emoji. Because there’s a whole alphabet of emoji, people can spell out things in reaction to your messages. You can’t delete these, so if you have a problem with people spelling out things they shouldn’t, you can turn that ability off under @everyone in the channel-specific settings. You can also hover over the reactions to see who placed them there. If you have rogue admins, the “Audit Log” under the server settings keeps track of all administrative actions, such as deleting messages or banning users. This way you can track down who’s causing problems and remove them. If you have a problem with outside spam, you can set the auto-mod level under “Moderation” in the settings. This requires new users to verify their email or be an active discord user before joining. If you really need help moderating, there are a couple of bots you can add that will help. MEE6 is my personal favorite, with it’s nice web dashboard and ranking system, and Dynoworks nicely as well. You can browse other discord bots discordbots.org.